ChronoTimepieces started as a side project of a group of watch collectors and friends in the beginning of 2017. 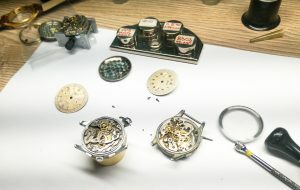 We were trying to clear out some space in our collections when we realized, the hunt, restoration and getting new pieces is what drives our watch passion the most. Since that moment we worked hard to equip a studio here in Bulgaria, hire the best watchmakers and get ahold of the precise machinery needed to produce, fix and restore parts and watches. ChronoTimepieces took off almost immediately and nowadays it has grown to a sustainable business. Now we do this full time, more professionally and we can proudly say that we offer some of the best ticking vintage chronographs, rare pieces and modern watches. All because We Love watches and We Love dealing with them and learning about them every single day.